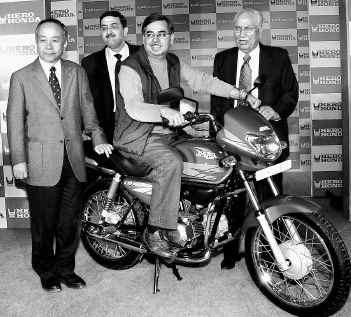 In desperate and somewhat bold move, India's largest motorcycle company Hero Honda has decided to launch 7 new bikes. Though going by it's in-house expertise, most of the "New" bikes would be sticker and graphics changes, Hero Honda also plans for a new variant of it's CBZ Extreme which is supposed to see some technical changes too (I really pray the Karizma also gets it's due). Apart from this the company has also set high sales targets for it's dealers during this festive season. With the economy's speed being hampered by global speed breakers, most of the dealers are finding it bit difficult to woo the customers, but still we all know that in the 100-125cc segment, no one can beat Hero Honda. The idea behind his march is the Silver Jubilee year of the company, where the company is eyeing to achieve the highest sales in the history in the festive month of October by achieving a sales figure of 6 lakhs units as against it's last highest for the month of October which was in 2006 when the company sold 5 lakhs units. Like it or not, but it seems that apart from Yamaha India, Hero Honda seems to be the only other bike manufacturer at the moment who is trying to bring out something new (even if mostly it would sticker and paint jobs!!!). Bajaj is surely disappointing it's customers by it's overly stretched silence. Yo Dude.....Congrats!!! ZMA is definitely a great bike no questions about it. A rock solid ultra smooth engine, great pick-up and an astounding package. The only thing it lacks is good attention from HH!! Lucky you..... I'm still to do a test ride on the FZ16. Well Yamaha bikes do have their torques in control and FZ16 does take that tradition ahead. As for the one best 150 in the market..... yes it is because of it's technology, ride quality and styling (the Bajaj and the HH have some real serious thinking to do here). Yamaha India is now two up above it's competitors in the 150cc segment with the R15 and FZ16 in their stables. I'm really keeping my fingures crossed for the CBZ Extreme upgrade!! and here's the link for the pics of the new cbz-xtreme..
to add to the 150 cc list.. Thanks for sharing the info. It's so nice of you guys. Rightly said buddy..... it seems that most of the International Bike Manufacturers are either directly bringing their beggies(which are out of afford for most of the enthusiasts) or bringing funny bikes and trying to sell them by mentioning them as a strip down version of one of it's beggies. The question is.... are we kids to be played with?? I guess not!! I have republished the Old Posts of my blog..! !